Last weekend we took off on Saturday for a color tour. The day started out sunny and blue skies but by the time we got to where were going clouds rolled in and the temperature dropped. Later the rain started that lasted for 4 days. I didn't get a lot of great pictures but I'll share a few. Later in the day the sun came out again and I tried to capture a shot while speeding by! Last Saturday was also Sweetest Day which we celebrate as our official "first date". We met in 1973 so that was 44 years ago! 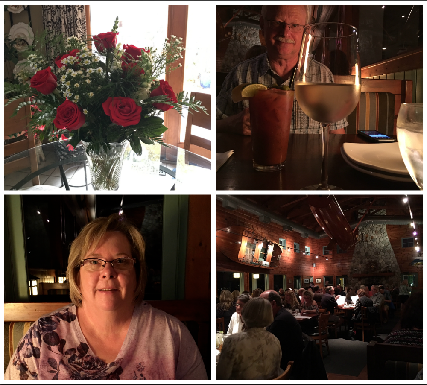 Dan brought me flowers and we ended our color touring day at a favorite local restaurant with a classic up north feel. I had a Pinot Grigio and he had his favorite Bloody Mary. Did you know about the new "wreath style" mums? Ha ha…just kidding. We had rain for 4 days straight and the mums just flattened out. Our first frost Oct. 26th. I went out to capture a picture because the sun was creating a glow from behind the scarecrow’s face but it moved off just about the time I got there. I went back in the house turned around and then it was glowing again…I think the sun was having fun with me! Since we've just had our first frost things will change quickly. Everything is so cozy looking right now. There are still things to put away and cover up for the winter. 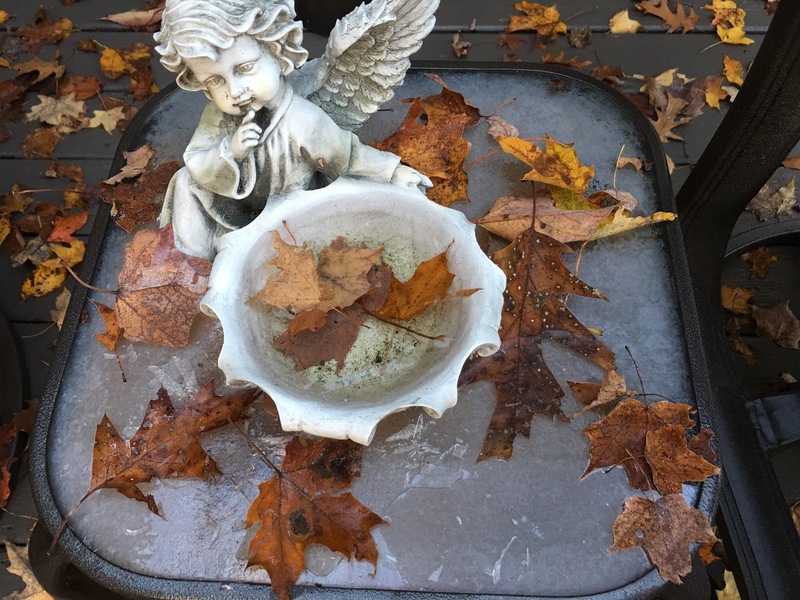 My favorite shot was this little accent table frozen with leaves and the little bowl was iced over. It's been too wet to even blow off the leaves but we'll get it done because they stain the surfaces so we don't want to leave them on the deck. Special Thanks to Linda my Blog designer for creating my new blog header. She’s a miracle worker and if you ever want to upgrade your blog, straighten up problems you are having check her out. Frost? WOW! I love the changing of the leaves. We do not get that down here. We have not had that first frost yet. We got close here in Illinois but nothing yet. What a sweet dinner date you had for Sweetest Day. Happy Friday. Have a wonderful weekend. Hi Liz, Love your new blog header and your pretty pic on the sidebar. Linda does such a beautiful job designing blogs. What did we all do before her creativity. Lovely photos from your fall tour. Even with the rain you got some great pics. I was going to say, hey I think I have that wreath mum. haha!! They do tend to flatten out when they get tall and then get smashed from wind or rain. Congrats on your 44 years together. Looks like you enjoyed a beautiful Sweetest Day. Liz, your trees are looking beautiful! Our's seem to be turning more today. Your frost appears to be a killing one for sure. We didn't have one as predicted last evening. Linda sure made your header even prettier. Looks like you had a great color touring day and ended with a beautiful evening with your Sweetest...Happy 44th! Never have seen the wreath style mums...love them!...and love your new blog design! We have not had a frost yet....I am going to take advantage of the mild weather as much as I can!....Have a great weekend Liz! Such beautiful fall colors! This is my favorite time of year. I hope that you have a wonderful weekend! Liz, I can't believe that you guys have frost! I am in the northeast and we always get a chill early in October and it's still a/c weather here. It's a bit unnerving actually! Everything is still green. Your neck of the woods looks a lot more festive. Ps...Happy 44th Date Anniversary. How fun! Pretty! It's probably peak color at our mountain house this week, but we're going to miss it. We're leaving for SoCal soon because my brother's funeral is Saturday. So glad you took a drive and saw some amazing color. We had a freeze this morning, but our weather is warming up tomorrow. We'll be having the same weather as SoCal!